Roman Chamomile essential oil has a sweet scent, often thought to be similar to sweet apples. Chamomile oil is rich in Azulene, a powerful anti-inflammatory that is formed during the extraction process. The oil is used by aromatherapists for relaxation and is renowned for its calming and soothing properties. When used in skin treatments, chamomile oil may help to smooth out broken capillaries and improve elasticity. It is also thought to be extremely effective for soothing dry, irritated skin. Roman chamomile essential oil is extracted by the steam distillation of the flowers. Chamomile blends well with bergamot, lavender, jasmine, tea tree, grapefruit, lemon, geranium, patchouli, rose geranium and ylang-ylang. 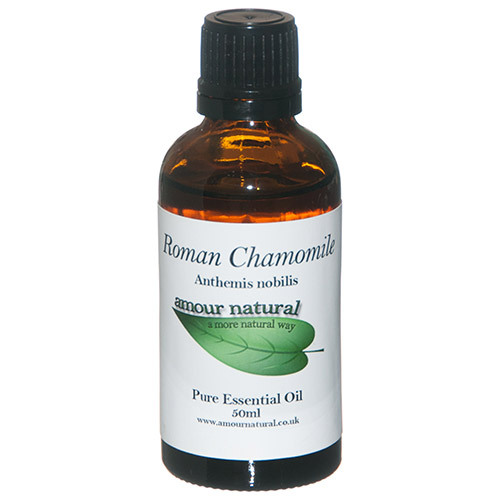 Roman Chamomile Pure Essential oil. Below are reviews of Amour Natural Roman Chamomile Pure Essential Oil - 50ml by bodykind customers. If you have tried this product we'd love to hear what you think so please leave a review.